Barksdale’s Services is your local source for professional tree service in Calhoun County, AL and Anniston, AL. We’ve been providing comprehensive tree services since 1978 and are well equipped both mentally and physically to help you with any and all of your tree-related needs. Call us today to speak with one of our knowledgeable arborists! If you’ve been searching for encompassing tree service in Calhoun County, AL, let your search end here. Barksdale’s Services has been proudly serving all of the arborist needs of people in Calhoun County for more than thirty years. As your local certified and fully insured tree solution experts, we’re committed to providing only the highest quality work for your convenience and complete satisfaction. 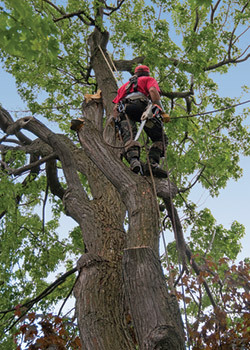 We offer a wide variety of tree services including but not limited to tree trimming, tree pruning, tree removal, tree stump removal, stump removal, foliage maintenance, tree health consulting, tree planting, tree structural training and root care. We offer 24-hour emergency tree services in Calhoun County, AL. We are certified and insured to provide tree removal service in Calhoun County, AL. We are a proud member of the Chamber of Commerce in Anniston. We have been serving the tree care needs of people in Calhoun County since the late 70s.